Location, location, location! 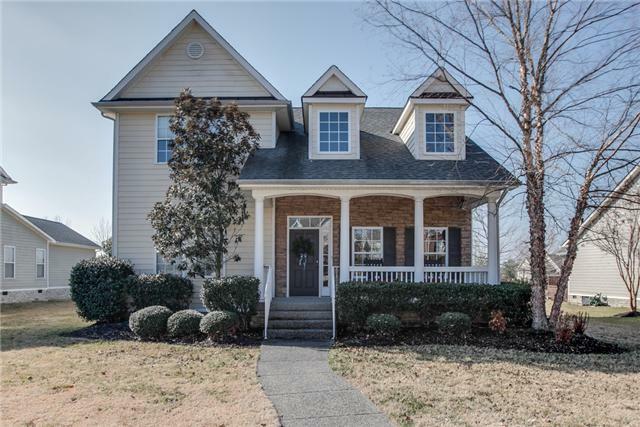 This adorable home at 1325 Liberty Pike is move-in ready and sits on the pretty lake in the popular McKayes Mill community in Franklin. Ites conveniently located away from it all, but close to all the amenities Cool Springs has to offer. Perched just behind a beautiful wrought iron gate with stacked stone pillars is this traditional style abode that features an expansive stacked stone front porch where you can rock your cares away with a glass of sweet tea. With an open concept floor plan and many upgrades, it features three bedrooms and two and one-half baths on just over a quarter of an acre, with parking capacity for two. Therees plenty of room for the entire family, with 2,517 square feet of living space on two levels, including a relaxing sunroom. Listed at $349,900, perfection like this wonet be on the market for long. Youell be amazed as you enter the two story foyer of 1325 Liberty Pike. The grand staircase features custom paint, built-in bookcases with up lighting, and wonderful hardwoods in the adjacent sun-filled library/office. Special touches like thick crown molding throughout the home, gleaming hardwood floors and special art alcoves interspersed provide flair and a designeres touch. Always the heart of the home, the large eat-in kitchen is open to the family room. Ites the perfect spot to entertain a crowd. The kitchen features glazed cabinets, Corian countertops, a tile floor and a huge walk-in pantry for the ultimate in convenience. Special touches include a pretty chandelier and recessed lighting, along with a breakfast bar. The family room includes a gas fireplace with mantle, a window and a doorway leading to the spacious sunroom. A cool, calming ceiling fan anchors the room, while an oversized doorway accents the openness of the floor plan and easy flow of the homees design. The fabulous sunroom, which features slate floors and spectacular views of the backyard and serene lake beyond, is separately heated and cooled for the ultimate in energy savings. Also on the main level is the master bedroom suite. It features his and hers closets and wonderful natural light. The master bath also has plenty of space and includes a double vanity with makeup area, a Whirlpool soaking tub for those extra long days, and a separate shower. The two upstairs bedrooms are roomy, with large closets and abundant natural light, and a bathroom conveniently designed with a door separating the double vanity from the shower area. A large bonus room is also located on the second level, and could be used in a variety ways. Perhaps a playroom, game room, office or all of the above since ites so spacious. The choice is yours. If youere looking for a move-in ready home with designer touches – located on a prime lot, come see 1325 Liberty Pike in McKays Mill today. Move in before school begins. Ites zoned for Clovercroft Elementary, Page Middle and Page High. Contact Dee Russell with RealtyTrust Residential today, (615) 207-4585, or email Dee@DeeRussell.com.